I have been a member for years but I must have been asleep at the wheel. This is an amazing wallpaper and rendering, every thing just looks so real. I may keep this as my desktop for many months after Christmas as it will take me a long time to get tired of this one.....will just have to be Christmas in February, May and July.......Thanks. Any shot at this one in a Galaxy S4 or S5 resolution? Love it! My favorite Christmas background. Need a 1080x1920 for my S4 though. I really really love this version. I love the blue and how it lights everything up. I have it as my background on my laptop and can't get enough of it. GREAT JOB! This image looks truly 3D on my iPad's Retina Display. Freaky. The red background makes for a great touch as others have stated. It really makes the details on the tree stand out nicely. This new version is wonderful with the red sunrise/sunset in the background. On a side note, did you know that all of your images that are listed as 480x320 are coming out as 480x450? Blue tone pictures are very easy on my eyes, and I think both versions are just amazingly beautiful. Thanks for the Pickle Jar! I much preferred the red sunset as well (there has been too many blue tones in the recent work imho). Any chance of a render like the original, but with a green tree???? I think that would look really nice. Ryan, I have the blue and red variants transitioning as backgrounds, and the effect is superb. Thanks of all of your hard work! Merry Christmas! I actually don't have a problem with the red sky but I like the blue equally. Now I can't decide which one to put on my desktop. It does appear, though, that on the night one there is a bit of leftover red underneath the ledge below the tree, I think it was red light reflected off the water that didn't get replaced. Thanks for a year filled with wonderful images! Happy Holidays and best wishes for a great 2012! I still like the original render, but I much prefer this "Blue Christmas" version; the reddish clouds and sky just didn't seem to go with the blue trees. Thank you and Merry Christmas, Ryan, to you and your family! personally, I like both versions. They each have a bit of surrealism to them as well as realistic touches. I really like this version of this render very nice you really have captured Christmas in it. I like the red sky but it does feel a little unnatural. Maybe if there were more oranges and yellows it would help relieve some of that feeling. I really like the red in the sky. With all of the fear of wildfires that I've experienced in Texas this year, the tree represents Hope in the face of adversity. I think this is a great image and you definitely need to keep it this way. By the way, It really looks fantastic on my Galaxy Nexus. I have gotten several comments on it. I love this one. Freaking fantastic. The sky seems as if the sun's just about to come up, nothing freaky or weird. I think I was a little negative on this at first I didn't like the red before but now its grown on me a little. Keep trying new things Ryan you'll never please everyone. I hope you and your family have an awesome Christmas! I think the contrast between the red and the blue is just too stark. It just doesn't say "Christmas" to me. Hard to put my finger on it, but there is just something going on here that gives me an uneasy feeling. Just my two cents. Love your work, Ryan! Keep it up and Happy Holidays! I adore the light in the tree on this one, it's beautiful. But the red sky just feels threatening to me, contrasting with the blue in a jarring way that makes me imagine a disaster film set at Christmas. o.o Maybe you could make it less scary by toning the clouds down to pale pink, or angling the scene so that the sky is not directly behind the trees? This by far is one of my fav wallpapers....10 out of 10....Awesome man...thanks! Being different is not what I don't like about this scene; I'm all for trying new things; I just don't think that this particular new thing (the red sunset sky) works for this particular scene, at least not for me. I do think that adding red could potentially be a good thing, but is there any other way that you could add it (on the trees, or maybe even on the stars or a few clouds or an aurora borealis instead of changing the color of the sky itself)? I really like the red sky. It adds a sense of mystery to the Christmas spirit. Christmas should not just be about warmth and family and presents (though all of those are vital and highly important) but should also be about the mysticism of tradition, the story of Jesus' birth and/or the celebration of the re-awakening sun after the longest night of the year. The red sky includes that in my opinion. Been using Gotham Garden Autumn for a while now. I've wanted to switch over to something wintery, but just did not feel like giving into the black /white/ grey palate yet. Red sky at night, desktop delight. I love the color in the Sky! My favorite dual screen of all time. Great use of perspective and I love how the right screen ends up dark, but with details. I wish we could rate the images separately at the different resolutions (single vs dual vs triple) because I don't think it is fair to rate them all in one category since the different resolutions changes the image. I meant to say it looks AWESOME in the dual and triple versions. I love the red sky. I mentioned in the single screen I hated the bright tree because it looked flat and 2D. It looks different in the multiscreen versions, perhaps it was tweaked or maybe something happened to the 2560x1600 lossless? Looks much better in the dual and triple versions. I happen to be a fan of the red sky. I like the effect of the red/blue contrast and that it has a different look than most Christmas wallpapers. I put this one up right when I saw it. I like it, but it doesn't say "Christmas". The red sky is ominous. I would be interested in seeing a different approach. I love it. Next to "Magi" this is the best Christmas wallpaper you've done yet. The red sky gives it that extra push above the rest. I like the red sky, as it adds a nice contrasting color to the scene. the main tree, the forest behind it and the water are all very, VERY blue. The red sky makes the foreground tree pop. I think what everyone may be attempting to speak to is that every other variation to this, including the ones with both white as well as colored Christmas lights, the foreground tree was the focal point to the picture. Here the focal point is the sky; and you don't want it to be the sky, you want it to be the tree. Your eyes are drawn away from the tree, and the brain don't like that. I think the red sky really adds to the scene. This is a great update. The one thing I am not a big fan off, in the multiscreen version there is almost no color outside of the center scene. It makes the side monitors too dark. This is just flat out gorgeous!!! As a friend of mine likes to say - Strong Work! I really like the contrast between the photo-realistic sky and the fantasy tree. It has a lovely surreal feel. I love it. It's a very nice scene and the colors are great. I'm sure you can improve it but the only things I wish were better are the clouds. Merry Christmas and thanks for the great year of art! As a Christmas scene, this doesn't quite do it for me. I love the contrast of the Red and Blue, but it doesn't feel like the holidays in its current presentation. I would either lose the red sky or make it a much less prominent color, and perhaps add some subtile halos to the lights on the main tree. Some subtle green would also add depth to the scene (as that color is completely absent from the image). I'm sad that Vue gave you such trouble for this render; it sounds very frustrating even with the few details you mention. This makes me sad to have to confess, that I don't really like this update. The tree is ok, but I really don't like the sky. I don't think a sunset is a good sky for this particular scene (dark with stars as in previous versions is definitely best). I also really miss the snowier feel of the previous versions. The previous two Blue Christmas’s are favorites of mine. But this one, not so much. Generally speaking it's too claustrophobic. Too many happy little trees. I think we need to be able to see through the trees a little more and into the distance. On the other hand it looks like I am one of the few yes votes on the red sky. Love the color. I think the problem here is the clouds. Too puffy or not natural, not sure. I did not like the blue tree at first. But since you mentioned your son’s reaction I am now on board with the "magic" tree too. I love the way this looks, the contrast with the tree and the sky, everything. Looks amazing! This is awesome and can't wait to see the variations you come up with for the Pickle Jar! After seeing so many reviews dishing this, I just had to comment. I love the red sky, and think the tree looks amazing. I have to agree with your son, the tree does looks magical. I've been a lifetime member for years, and must thank you for years of enjoyment you have brought to my desktop and mobile devices. Merry Christmas to you and your lovely family. The central tree, as noted elsewhere looks very 2D. It is also way too blue. The red sky in the background really detracts from the whole image, as well. Somehow it's just not very Christmassy at all. I love your stuff, so I'm kinda sorry to pan this image. This is awesome except the bright tree somehow looks two dimensional compared to previous versions where the tree looked more "3D". The lighting the tree gives off to the surroundings is what makes this great, I just don't happen to like the look of the tree. This is gorgeous and is staying on my desktop. Instant *Gasp! * as soon as I saw it. Thank you for a beautiful image. Merry Christmas and Happy New Year to you and your family, Ryan! No doubt this took a lot of time and effort and trying to please everyone is a difficult, of not an impossible challenge. But I'm impressed. I'm okay with the sky as it adds some warmth to a cold, crisp Christmas night. This is the season to relax, enjoy family and if you're not able to make any pickle jar versions before Santa hitches up his sleigh, no worries. LOVE the concept but not the execution. As almost all would agree the sky needs revision. Historically Ryan (and please don't take offense) doesn't nail images on the first try. I believe it will turn out amazing as usual. I know Vue crashed a lot on you but the render quality looks amazing in this image. It is so sharp and clear and makes the textures that much better. I would say it was definitely worth the extra time. I think this image would also be a great stand alone landscape piece with out the Christmas tree. I like the sky, but I am partial to sunsets. Love it except for the sky - I think it would look better with a star filled sky with the North Star above the tree as someone else pointed out. Perhaps I could add a version with a black night sky in the Pickle Jar later. Sky kills it for me though - would have expected the north star or something. The trees, rock, water setting is great. I think there needs to be color variance in the lights around the tree. If there were some green, yellow and red ones it would feel more like a Christmas image. As is when I see it I dont immediately think of Christmas. Other than that it looks really good. Reminds me of a lot of fantasy books like LoTR where there are pockets forests/lands protected by ancient magics from the evil that is spreading through the lands. I like it a lot, great setting & composition. The stark contrasts in colors really make the tree POP. I love it Ryan! Can't say anything else other than I like the contrast between the red sky and blue tree! Plus I love how you put it on that rock that hangs out over the water. It's all perfect! Really like the blue and red contrast... actually wish I could see more sky, and also maybe a frozen lake with just a little snow on the edges of the lake to blend in with the shore snow... maybe even some snow on the trees. I don't know if it just me, but my first thought with the red sky was forest fire. Not a bad thing, just my impression. I like the image and this definitely is on par with what I expect from your work. Great Job! The textures on the trees and rocks look amazing! With such a red sky you'd think the trees would look at least slightly red in the darker parts. No need to re render though I think, perhaps just a bit of colour balance? I agree with John and I'm not reading The Way of Kings. It just put me off. It was too strong a color and took away from the tree. Another nice one(as always), my only nitpick would be the sky. Not the color but the clouds, I think the clouds should be a little more subdued to match the trees. This is a beautiful image. I'm not sure about the red sky though, instead of feeling Christmasy it seems more nefarious. Although in all honesty this could be because I'm reading The Way of Kings and it often speaks of a red sky looking like blood at sunset. reading about all those technical difficulties made me cringe for you. I can't imagine having to restart a render, as i know how long that process takes. I think your wallpaper, even though it wasn't quite what you wanted, turned out great! One of your best Christmas wallpaper! Not that good on my PC (too dark), but looks great on my XOOM. Looks nice, been waiting for your Christmas release. :P I pretty much just change my wallpaper according to the seasons and holidays. The fine detail is truly spectacular! Well worth the wait! sky-line reminds me of a sunset...maybe try for that in the sky? 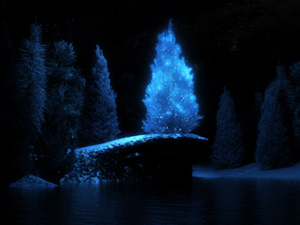 Trees look amazing though, and i do like the faint sparkles throughout. The link to the 2002 version points back to this page. I like the sparkles in the sky, but I think the scene could be lit up better (so one could see more than just the tree in the middle. Also, there seems to be an ominous, hidden face above the tall tree on the far right. Can't wait to see some re-renders! I wanted to try something a little different with the sky this time around. Brightened my day! Not sure about the colour of the sky but I like it!